How to set up Contacts Services for access on your network. Over the last two weeks we’ve worked with the Server app on macOS Sierra to set up the Calendar service. The Calendar service uses CalDAV, a web standard that allows you to connect to calendar services, add and update events using a variety of calendar apps. In fact, when we were working with the calendar service you could have just as easily added your server’s calendar service to Fantastical or BusyCal because both support the CalDAV standard. Server’s Contacts service works using a similar standard called CardDAV, which, like CalDAV, allows a variety of contact apps to connect to and update data stored on your server. And, in fact, CalDAV and CardDAV are linked to each other on your server. You can see this link using the Server apps log tools. Select Logs in the sidebar of the Server app. Locate and select the Calendar and Contacts log. Note that the two are linked together in the log. Server’s Contacts service allows you to provide a centralized database of contacts that can be used by edited and updated by anyone using your server and contact data can be used in any CardDAV capable app. 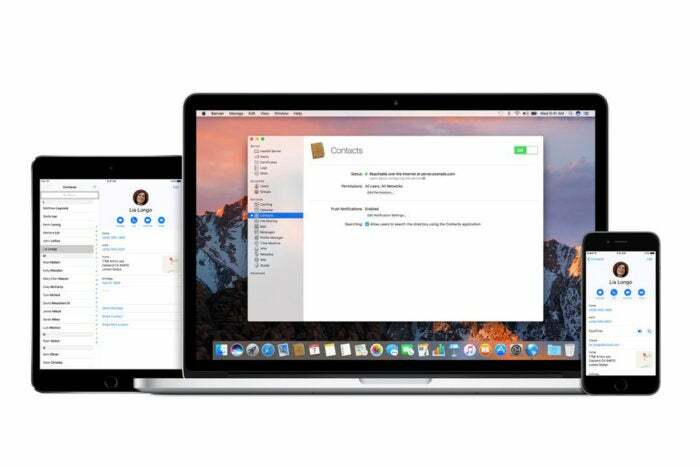 Before we set the service up on your Mac, let’s look at the Contacts app to see what’s available before we set up and connect to the Contacts service. So, open the Contacts app. If you’re using iCloud you’ll see an iCloud group. This is synced across all your iCloud-connected devices. If you’re aren’t using iCloud you should see an All Contacts group in addition to any other groups you may have created. This syncs only on your local hard drive. Now, let’s get connected to the Contacts service. Turning the Contacts service on is simple, all you need to do is flip the service’s switch on. Select the Contacts service in the sidebar of the Server app. Turn the Contacts service on. Once the Contacts service is turned on it’s simple to get the contacts app set up with it. Scroll to the bottom of the list of preconfigured accounts. Select Contacts from the list of available services on you server. Select the account you created in a previous episode. Put a check in the box next to Contacts. Select your server’s directory in the sidebar of the Contacts app. Click the + button at the bottom of the Contact window. Begin typing the name of the user created in the previous step. You should see the name of your test user and the new email address you created show up in the Mail App’s autocomplete list. Additonally, any other devices you use that are authenticated to this server account will have access to contacts created and stored on your server. You can think of it as your own private iCloud-ish contacts list. Server’s Contacts service offers one more directory option that is as simple as putting a check in a box. When you put a check in the box that says, “Allow users to search the directory using the Contacts application allows your users to use information stored in your Open Directory database. So, any users you’ve created or imported into Open Directory that has related contact information will also be made available to anyone connected to your Calendar service.